Howard and Karen Vipperman are very patriotic individuals. Karen and Howard, along with Faith Grimm, founded and organized Adopt a Unit. The mission of Adopt a Unit is to adopt a military troop for the duration of their deployment to either Afghanistan or Iraq. They collect donations to send to the troops periodically during their deployment. The packages include food, grooming supplies, magazines, socks, hats and letters from home. Some of their adopted units included 101st Airborne Division, Marines 5th Battalion, US Army Black Hawks and California Army National Guard. Howard and Karen were awarded the highest civilian award that the military gives. The award is the Concord Minute Man Award, given to those who serve to defend freedom. The Sikorsky UH-60 Black Hawk helicopter is a four-bladed, twin-engine, medium-lift utility helicopter manufactured by Sikorsky Aircraft. Sikorsky submitted the S-70 design for the United States Army’s Utility Tactical Transport Aircraft System (UTTAS) competition in 1972. The US Army designated the prototype as the YUH-60A and selected the Black Hawk as the winner of the program in 1976, after a fly-off competition with the Boeing Vertol YUH-61. The Sikorsky UH-60A entered service with the US Army in 1979, to replace the Bell UH-1 Iroquois as the Army’s tactical transport helicopter. Modified versions have been developed for the US Army, Navy, Air Force and Coast Guard. In addition to US military use, the Sikorsky UH-60 family has been exported to several nations. 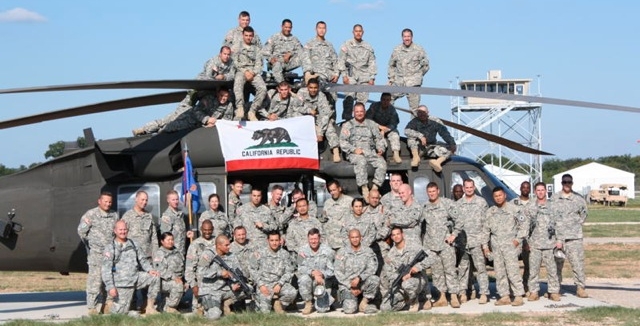 Black Hawks have served in combat during conflicts in Grenada, Panama, Iraq, Somalia, the Balkans, Afghanistan and other areas in the Middle East. One of the earliest uses of the name Black Hawk was that of an American Indian tribe warrior. Black Hawk born Ma-ka-tai-me-she-kia-kiak (1767 – 1838) was a war leader of the Sauk American Indian tribe in the northern Midwest of the United States in what is now Wisconsin. Although he had not inherited his position, Black Hawk earned his status as a war chief by leading raiding and war parties. During the War of 1812, Black Hawk fought on the side of the British against the US, hoping to push the American settlers away from Sauk territory. Later he led a band of Sauk and Fox warriors, known as the British Band, against European-American settlers in present-day Illinois and Wisconsin in the 1832 Black Hawk War. After the war, he was captured by US forces. Shortly before being released from custody, Black Hawk told his story to a newspaper reporter with the help of an interpreter. He published – Autobiography of Ma-Ka-Tai-Me-She-Kia-Kiak, or Black Hawk, Embracing the Traditions of his Nation – in 1833. The first Native American autobiography to be published in the US, his book became an immediate bestseller and has gone through several editions.